This is a really gorgeous Easter collection. The hard cover is textured with sparkly glitter, which really makes this even more special. The first story - The Legend of The Easter Egg has stunning illustrations but for me, the storyline is just okay. It's about a boy who's sister gets scarlet fever and he has to stay with some other people. Most of the story follows that plot line. The lady he is staying with gives him an easter egg on Good Friday and tells him it is like the stone being rolled away, or the chick breaking out of the egg is like Jesus breaking free from the tomb. The little boy prays and gives his life to Jesus and wants to tell his sister. The story ends with him sneaking out alone and running back home to see his sister on Easter Sunday when he is allowed to go home. The look on the mothers face as he runs in the door gives a sense to the reader that all is not ok and maybe the sister didn't make it? But I think the assumption is that she does as the story goes no further than this point. For me the story was more focussed on the boys sadness at not being around his sister for Easter, and the point of the story felt like it was thrown in at the end. The second story 'The Legend of the Easter Robin' I have reviewed in the past here. Again, beautifully illustrated, it is based around a story of a little girl watching Robin's build a nest outside of her window, then lay eggs. She watched them hatch. The story is about how the Robin saw the crown of thorns on Jesus' head and tried to take it off. It was too hard for him but he managed to pull a thorn out of Jesus' head that was stuck there and Jesus blood dripped on his chest, staining it red as it is to this day. Sweet story. The third story 'The Legend of the Sand Dollar' is a story about two girls who have to go to the beach to visit family without their parents. No mention is made of the parents or where they are. I found that a bit strange as it was on my mind as I read the story. I wonder why it was necessary to write it that way as it took away from the story, creating a more negative vibe about the experience as seen through one of the girls eyes. Anyway, she goes out in the boat with her cousin to an island and discovers sand dollars. Her cousin tells her the meaning of them - being the Easter lily is on one side. In the middle of the lily is the star the wise men followed. Also the holes in it represent the nail holes, then when you break it, five pieces come out, which represent the doves promising new life. She then went and shared it with her sister and it seemed to cheer her up for a bit. 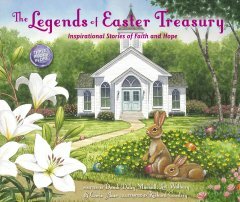 These legends of Easter are great ways to share about what Jesus did for us with children. I do feel the first and last stories have a bit of a depressing overall tone to them, as the protagonist for both is sad. But if that doesn't bother you, this is a nice way to have the whole collection all in one place. Please note that I was sent a copy of this collection for purposes of review, however all opinions expressed are entirely my own.